How to use another map style, switch between them, and how to create your own. 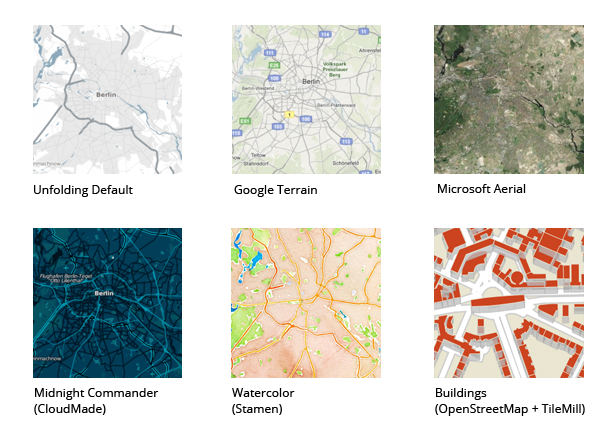 Also gives a short introduction to map tiles. Unfolding maps are based on pre-rendered map tiles. Each tile is a small image, and contains the topographic information of a rectangular map area as pixel-based graphic. By using tiles you easily can develop interactive maps. On top of the basis map you can draw markers, vectors, diagrams, user interface elements, and everything else. Unfolding displays maps in a default style, with cartographic data from OpenStreetMaps and tiles from CloudMade. To use another map style, simply specify it as second parameter when constructing an UnfoldingMap. This way, you can easily switch to one of the pre-configured map tile providers. For instance if you want to display a satellite map use the Microsoft Aerial Provider. Don’t forget to import the used provider class. Unfolding comes with a couple of pre-configured map providers. Check the MapProvider package API for more styles. You can also create your own MapProvider in order to load and use other map tiles. For that you need to know the URLs to access the tiles, and extend an appropriate MapProvider with a similar request mechanism. Take a look at the StamenMapProvider to see how to extend the OpenStreetMapProvider. If you want to create a completely new map style you can use different methods. For simple adaptations you could use the CloudMade style editor and specify its ID in the CloudmadeProvider. For more options you can create a map with TileMill. See the article TileMill for Processing for a brief introduction on how to create maps with TileMill. After you exported your styled map to a MBTiles file (a database containing the tiles), you can use it with Unfolding. For this, you need to add the SQLlite driver to your Processing libraries (included in the Eclipse template). Then, specify the path to the MBTiles file in the MBTilesMapProvider. In Processing you need to specify the absolute file path. In line 6 above, we use Processing’s sketchPath() method to access the MBTiles file. In Eclipse you should put that database file into your data folder, and reference it relatively. There are two ways to switch between two or more styles dynamically. In the following example, we create three maps with different map styles, but draw only the currentMap. All maps listen to map events themselves, i.e. all interactions affect each map, resulting in the same region. Only one map at a time is displayed, and only the tiles of that one will be loaded. Yet, after tiles are loaded switching maps is faster than switching providers. It takes more memory though. This option enables switching between different tile providers for the same map. All map settings are persistent, i.e. current transformations, markers, interactions, etc will stay the same. After switching the tile cache will be cleared and visible tiles loaded from new provider. Thus, it always holds only one tile set, and consumes less memory, but takes a bit longer to load.